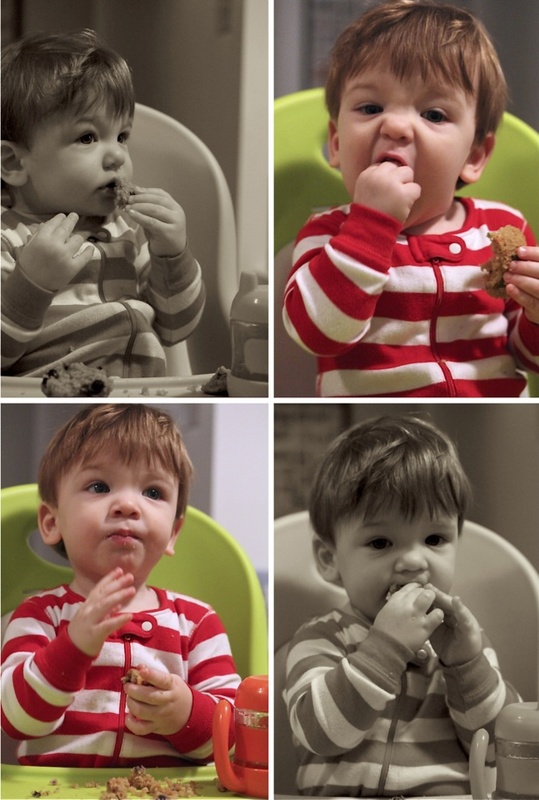 I've kind of been in denial that I have a toddler now - but I most definitely do! He is 13 and a half months old, he's most certainly toddling around all over the house, and he's starting to assert his opinions and making his preferences clearly known in that toddler-specific kind of way. Oh boy - deep breath. He's not a baby anymore. There. I said it. But I'm still in denial. Anyway, we are currently going through our first picky eating phase. Welcome to toddlerhood! But this came as a total shock because Zac has always been such an adventurous eater (he was famous for it in my family, in fact). But in the past month all he wants to eat is bananas and carbs (or anything sweet for that matter). If he's in the right mood I can get him to eat some meat or tofu - but vegetables? Forget it! He won't even taste them. So I've been trying to find ways of sneaking protein and vegetables into his meals, but with very limited success.... until yesterday. I looked him square in the face and said, "fine, you only want sweet fruit and carbs? I'm going to make you blueberry muffins. And they will be protein-rich and loaded with veggies.... and you're gonna love 'em!". So that's what I did. And it worked. Ha! Gotcha, little guy! You're eating carrots and zucchini and fibre and eggs and ground almonds and plain yogurt and you don't even know it! 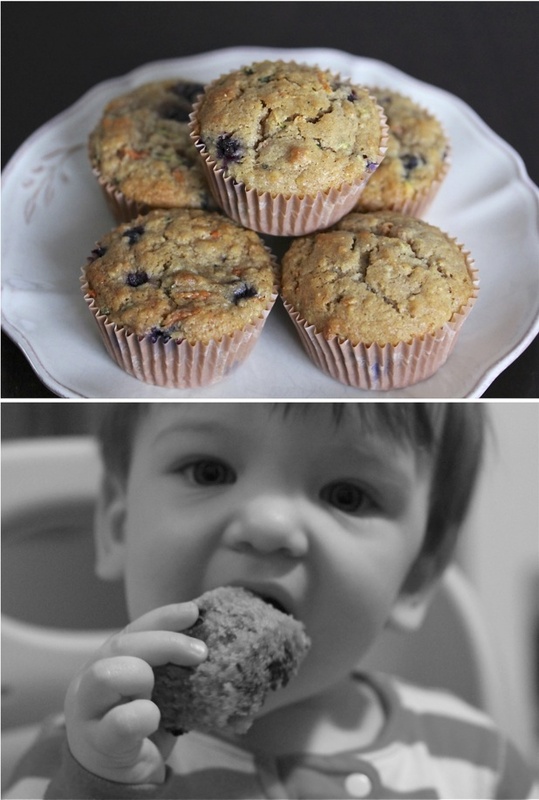 The muffins turned out wayyyyyy better than I had expected - they are downright delicious! And so, it's not really fair to call them toddler muffins, since the adult population of this household eats just as many of them. 1. Grate carrot and zucchini and set aside. 2. In a large bowl, whisk together the eggs, sugar, oil and vanilla. Mix in the grated carrot & zucchini, and the yogurt. 3. In another bowl, mix together all the dry ingredients (flour, oats, baby cereal, ground almonds, baking powder, baking soda, cinnamon, salt and ground flax seed). 4. Fold the dry ingredients into the wet, and mix until flour is just absorbed. If mixture is too dry, add 1-2 Tbsp of whole milk. Try not to over-mix. Gently fold in the blueberries. 5. Divide the batter into greased muffin tins (or line with paper muffin cups instead), and bake at 375 degrees for approximately 25 minutes - until an inserted cake tester comes out clean. 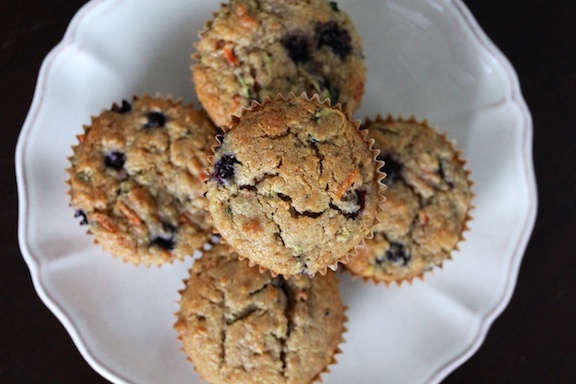 Let muffins cool completely on a wire rack inside their muffin tins. i remember those days of sneaking protein into yummy foods. and i hear ya about the toddler thing man!! wesley is a firecracker these days. and can do so much now. the other day i walked in to the kitchen to find that he'd opened the cupboard, pulled down his crackers and was eating one...i mean geez! and he's testing me too, he can climb on chairs now and loves to stand up on them...and i tell him no and he'll sit down. i look away and he stands up again looking at me waiting to see what i do! These sound delicious! Have you heard of the cookbook Deceptively Delicious? Jerry Seinfeld's wife wrote it. It's filled with recipes like that - to get your kids eating good food. I think next time I'll try to replace some of the sugar with ripe bananas and see what happens ! Thanks for the recipe! Catherine, I was thinking the same thing - that next time I'd try swapping some of the sugar for either banana or applesauce, and then just adjusting the amounts of dry ingredients (oats/flour/ground almonds etc). I'm glad your little guy enjoyed them! What is the baking temp for these?